Jonathan Bradbury Jardin and his long-eared black and white puppy, Tiger, live in Washington, D.C., where the President lives. 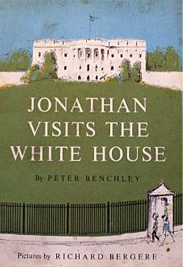 Today is Jonathan's birthday, and his mother has promised him a visit to the White House. "Tiger wants to see the President's house, too," says Jonathan. Visitors' dogs are not allowed in the White House, warns his mother. Now, what fun is a birthday treat without your best friend? How Jonathan manages Tiger's visit is a secret. The result is a tour full of surprises, delightfully illustrated by Richard Bergere.